At Brévedent campsite, everyone is invited to play, share and experience music! Music has been part of holidays at Brévedent campsite for many years. Music, whether acoustic in the bar, on the restaurant stage, or in the garden during the day, is shared with goodwill. Grasshoppers who want to sing all summer spend their holidays in Brévedent! 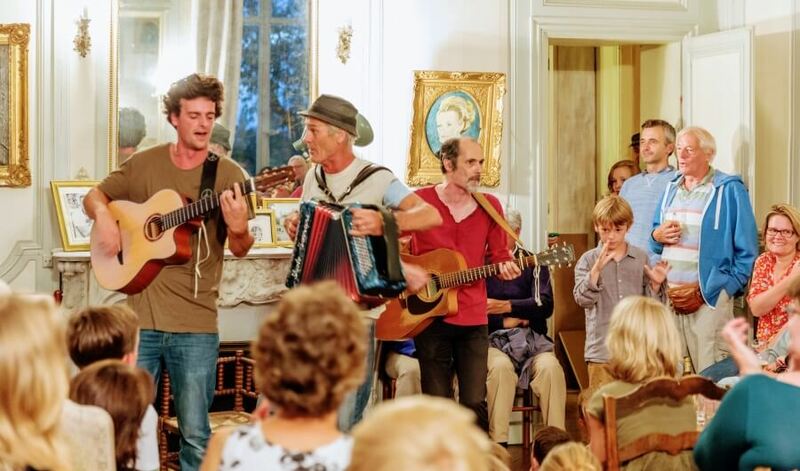 In high season, in July and August, the Castel campsite in Brévedent comes alive twice a week with acoustic music concerts. Over the years, Monday and Friday nights have become not-to-be-missed events for Brévedent holidaymakers. Les Ratures, the French pop group whose lead singer is Raphaël, kick off all these evenings with classic pop hits by artists such as Brel, Brassens and Aznavour, as well as their own songs. You don’t need to understand the lyrics – their energy is infectious. 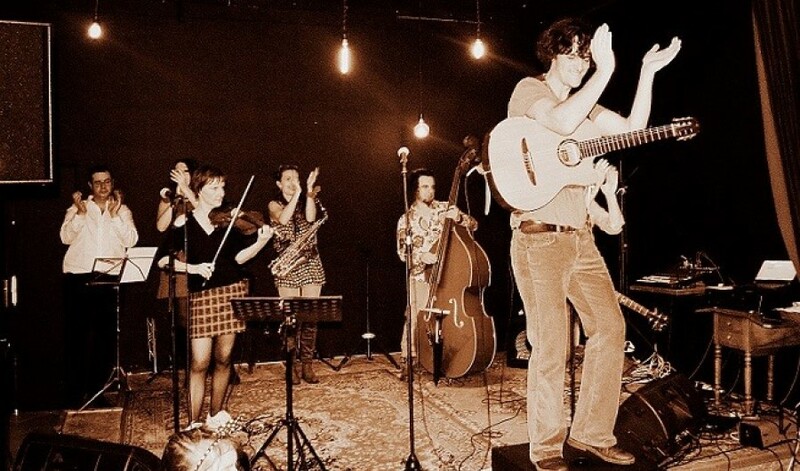 In les Ratures, Léon plays the accordion, Lysiana plays the violin, Tony plays the double bass, Didier plays the guitar, and Raphaël plays the guitar and sings. On Monday nights, the concert takes place in the castle lounge and music is played acoustically. Holidaymakers pack out this beautiful manor room, decorated with paintings, and young and old alike soon tap out the beat in unison. And if they get the urge then spectators can even sit at the castle’s grand piano and play a piece. On Friday nights, the concert takes place in the restaurant, and it’s an open stage! The restaurant’s small stage is equipped with a professional sound system, lighting, mikes, and even a few instruments such as a keyboard. All musicians – budding or veteran – are welcome, and there are surprises every week. One thing’s for sure – you’ll have a great time with the music! The atmosphere on concert nights is always warm and friendly, and also respects the peace and quiet of the campsite. The volume is controlled and the music stops by midnight.